This is soooo last minute—but so is everything else in my life right now! This year’s Napa Valley Book Festival is happening! It’s happening on Saturday, April 13 as part of Arts in April. And it’s a Poetry Crawl in partnership with Napa Valley Writers’ Conference. What? Well, after last year’s book fest, a few people urged me to change the date from October to April and make it part of Arts in April. It didn’t seem possible until the NVWC offered to step in and work with me to create a poetry-centric event. How could I say no? Poetry. I love it. I’ll bet you do too. So take a minute to get in touch with your inner poet; and I know you have one. We all do. Or maybe you were in touch with your inner poet when you memorized someone else’s poem. The poem below, by R.L. Sharpe, hung next to the bathroom mirror in my first apartment. I moved away from that apartment 30 years ago and still can recite this poem without hesitation. Are the builder’s for eternity? Honestly, I hadn’t given poetry a lot of thought for a very long time until the Napa Valley Writers hosted an awesome bilingual poetry reading on Valentine’s Day last year. Then when I went to Tin House last summer and listened to Tommy Pico, Camille Dungy, and Shane McCrae my love for poetry was reignited. I even wrote one...okay more than one poem since. Poets, my friend Angela says, travel a long, hard road as artists. It’s true, so I’m happy that I can help them in one small way: by organizing this Poetry Crawl. And you can help by attending one or all of the readings. The lineup includes nine poets, including several Poet Laureates from around California. It will be a great afternoon so come, listen to poetry, support local wineries, and learn about applying for the Napa Valley Writers’ Conference, a summer workshop for poetry and prose writers. Saturday, April 13. Free. For more details click here. 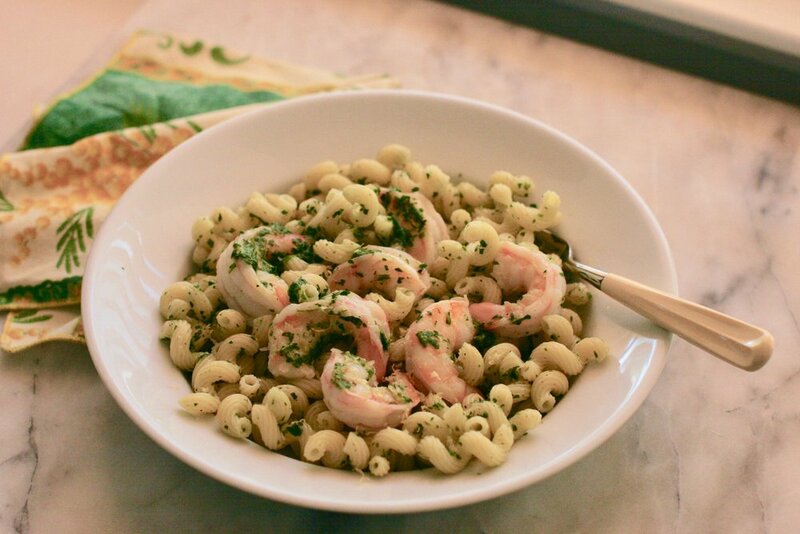 If you aren’t in Napa that weekend and need something else to do, may I suggest making pasta with shrimp and arugula-preserved lemon pesto? Yes, you when you look at these photos you might be wondering if pathetic rhymes with poetic—photography for me is a long hard road. I’ve never liked reading manuals and learning by doing is taking so long. You can see the teeniest of progression from really super terrible to a little less than really super terrible. (I swear I think someone moved my settings…) But ugly photos or not, the dish makes for a light and wholesome spring meal. What are you reading? I’m still reading Becoming and LOVING IT! I don’t even want to think about the next book, although I’ll be ready for it this weekend. This is a bright and simple dish for spring. It comes together quickly if you prep the ingredients before starting to cook. Put the arugula, lemon rind, garlic, and oregano a food processor and run until the mixture is finely chopped. Drizzle in 1/4 cup of the olive oil until a paste forms. Season with salt and pepper. (It will taste a little bitter; don’t worry.) Set aside. Cook the pasta according to the direction on the box. While the pasta is cooking, heat the remaining 2 tablespoons of olive oil in a skillet. Add the shrimp and toss until cooked through. Remove from the heat. Drain the pasta, reserving a little bit of the water. Return the pasta to the pot or a serving bowl and stir in the arugula-preserved lemon pesto. Season with salt and pepper. Stir in the shrimp and the olive oil from the skillet. Stir in the butter, check the seasoning and serve warm or room temperature.